When it comes to spring desserts, light and fruity takes the cake (or makes the best cake!). And the best part of EatingWell’s recipes is that they’re super-tasty yet healthier versions of the desserts you love and crave. Looking for new recipes to try? I combed EatingWell’s Pinterest boards for the most repinned spring desserts to see which stood out from the pack. Here are some of EatingWell’s most stunning and delicious spring cakes. 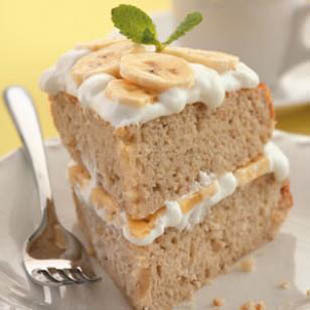 In this cake we layer delicate banana-buttermilk cake with a fluffy Bavarian-style cream that's made low-fat by combining nonfat milk with a reasonable amount of whipping cream. The rich taste makes it hard to believe that this cake has only 300 calories and 3 grams of saturated fat per slice. A cake with a meringue? Though not unheard of, this one is definitely a flight of fancy, a cake version of Key lime pie. And pretty to boot! A classic spring dessert, carrot cake gets a health-halo effect from the carrots—people think it's health food, but carrot cake is usually very high in fat and calories. EatingWell’s lighter version has about 40 percent less calories and 50 percent less fat than most. First, we use less oil in our batter. Then we skip the butter in the frosting (don't worry, it's still light and smooth). To ensure the cake is moist, we add nonfat buttermilk and crushed pineapple. Cupcakes are perhaps less intimidating than a cake and the perfect choice for some occasions. These raspberry-lemon cupcakes are topped with an easy cream cheese frosting tinted pink with a little raspberry puree. To make them healthier we use whole-wheat flour, although the flavor of the raspberry puree swirled into the lemony cake makes the wheat flavor undetectable.